A major shift in monetary policy could be on the horizon. Yesterday, Bundesbank President Weidmann stated that “a QE program is not out of the question”. Of course that quote was immediately followed by several criteria and requirements, like that it would have to meet certain quality standards and that its impact would have to be studies thoroughly. But still, that of all ECB-members, the President of the Bundesbank floated this statement should be considered as remarkable. While it is of course by no means certain if an ECB-ignited QE will ever become reality, it does seem pretty sure that this would lead to a change of course for the euro. A while ago I wrote about the two factors that have dominated the behavior of the euro in recent years; short term interest rates and central bank balance sheets. Those two factors have not been able to join forces for quite some time now. The difference in short term interest rates between the US and Germany have hardly moved at all as central banks from both regions continue to pursue very low short term yields. 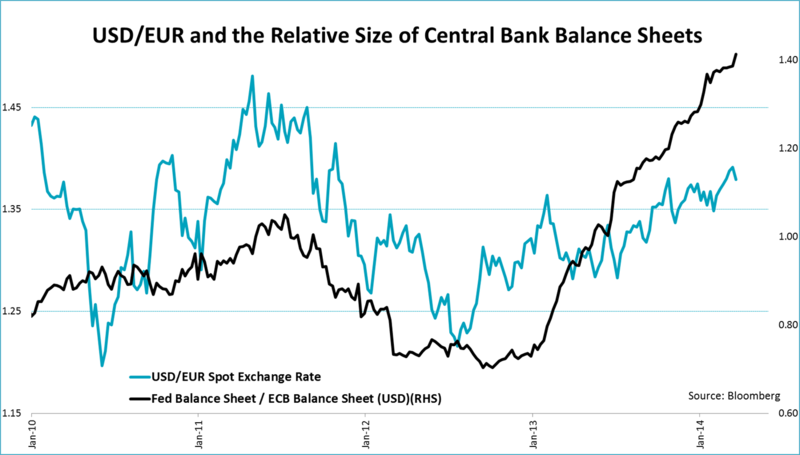 The difference in the size of the balance sheets of the Fed and that of the ECB has continued to increase, however. 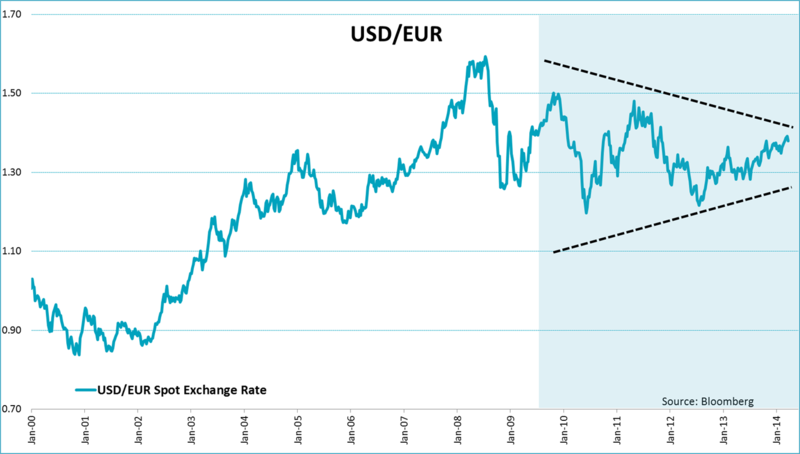 So, with only the difference in the size of balance sheet of the Fed and the ECB moving in a clear direction, the euro has strengthened against the dollar, albeit only modestly. But with an inception of QE by the ECB this is likely to change. As the Fed is moving exactly in the opposite direction, scaling down its bond buying program at every FOMC meeting, quantitative easing by the ECB would change the rules of the game. Now, the quantitative easing by the ECB can take a variety of forms as is discussed by many on a daily basis. The important message is that it will target at least one, if not both factors mentioned above. While the ECB will refrain from anything that even remotely qualifies as Outright Monetary Transactions (OMT) since the Karlsruhe ruling, it has several ways to increase its balance sheet. The most talked about option is another longer-term refinancing operation (LTRO) providing cheap financing for banks. While probably less effective as before, it could be related to the upcoming Asset Quality Review, now performed by the ECB. It could also follow the Fed in buying asset backed securities or other credit products. And perhaps it could even get away with buying government bonds by using size limits or by implementing some general rule to buy a wide variety of European government bonds. An example could be to buy bonds with a GDP-weighted or outstanding debt scheme to stay away from comparisons to OMT. Another way is of course to lower interest rates even further. A negative deposit rate seems very likely in this case. As Weidmann already stated “a negative deposit rate could appear to be the most appropriate measure if you wanted to counter the consequences of a strong euro appreciation on the inflation outlook”. And, finally, if it wants to make a solid statement, the ECB could also choose to use a combination of balance sheet growth and lower interest rates. 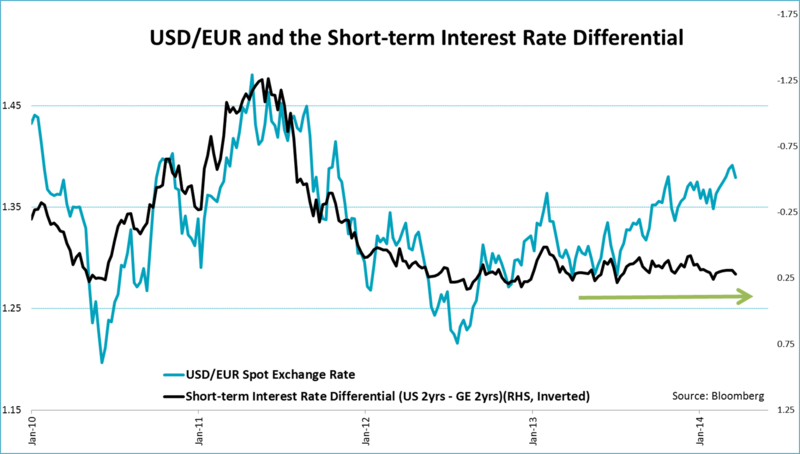 Independent of which kind of QE the ECB would choose, the euro is bound to change course. ← Will the Fed go bankrupt?